It was about as fine a week of trout fishing as one could hope for in early April short of having dry fly fishing. 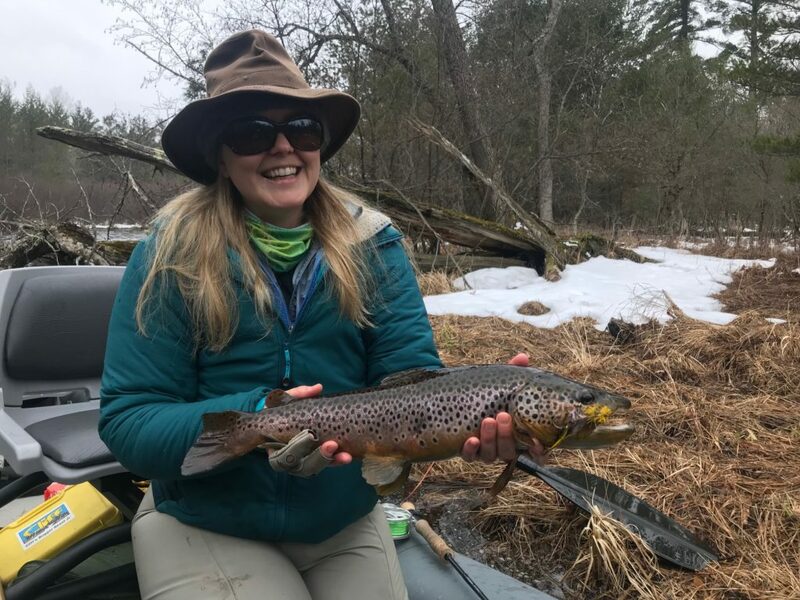 The trout were out and about, the rivers were and are running relatively clearish (in the upper reaches) considering all the reasons they shouldn’t be (big snow winter, warm afternoons, and even a little rain), and it’s been just warm enough to keep the ice out of the guides. It’s hard to predict this time of year. I know two guys that caught a lot of trout yesterday on nymphs. I know a few others that did really well on streamers. It was a great day. But optimism must be tempered. This weekend, with its highs in the 50s and maybe even 60s, could kick-off the spring BWOs. Or the heat and overnight warmth might serve to dump the rest of the snow into the river in the form of ice cold water. So what I can report is that last week was pretty great. 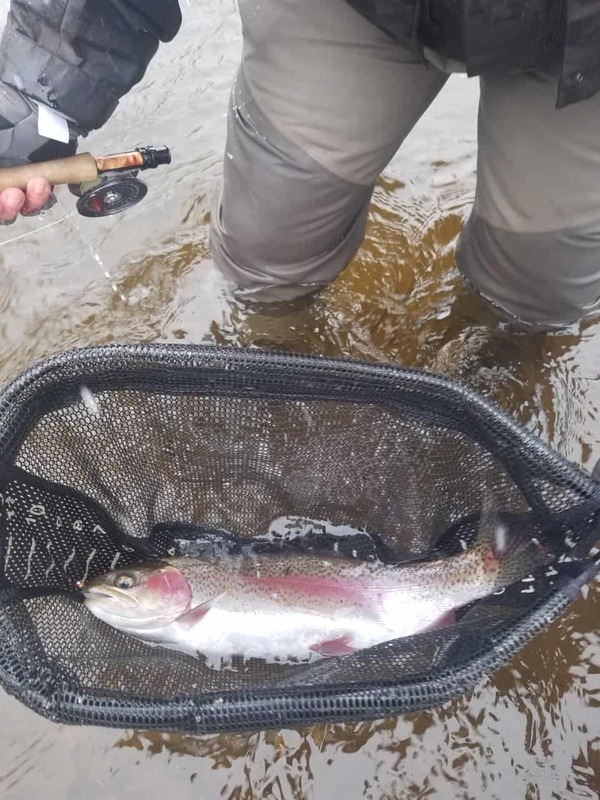 The rainbows are really spawning in the Holy Waters, and many are resting in pools either on their way up to their spawning waters, or on their way back. 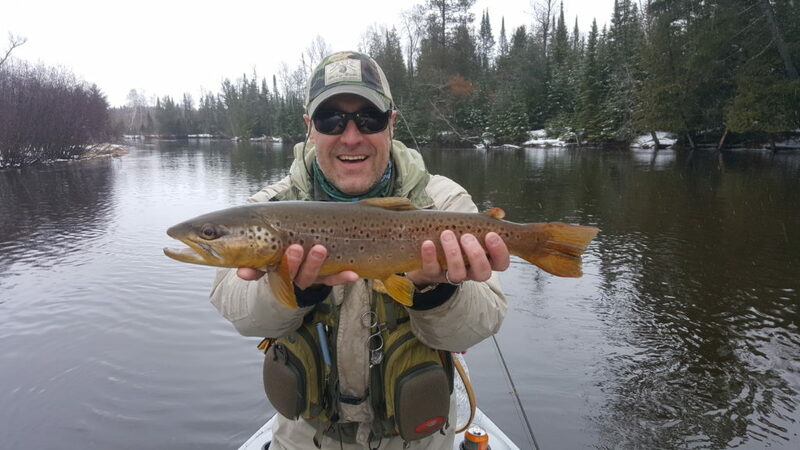 These big adults will return to the lower river and the backwaters of Mio pond, but the little trout they leave behind will stay in the upper Au Sable until they are 10-12″ and provide great sport. Some, I think, will stay and grow large. I’ll never forget a rainbow I caught as a teenager at about 7 pm on a hex in the Holy Waters in early July. It was sixteen inches and it fought like it was the front end of a bottle rocket. I don’t recall why I cast a hex at that dainty rise at 7pm, but I know it happened, and I was happy for the 2x I was probably using. We’ve been doing well with tungsten nymphs in the size 10-14 class that are peach/squirrel colored and more subtle biot-style droppers. We now have a huge selection of nymphs in the shop and we hope to show anglers how nymphing can really make a slow spring day into a great one. 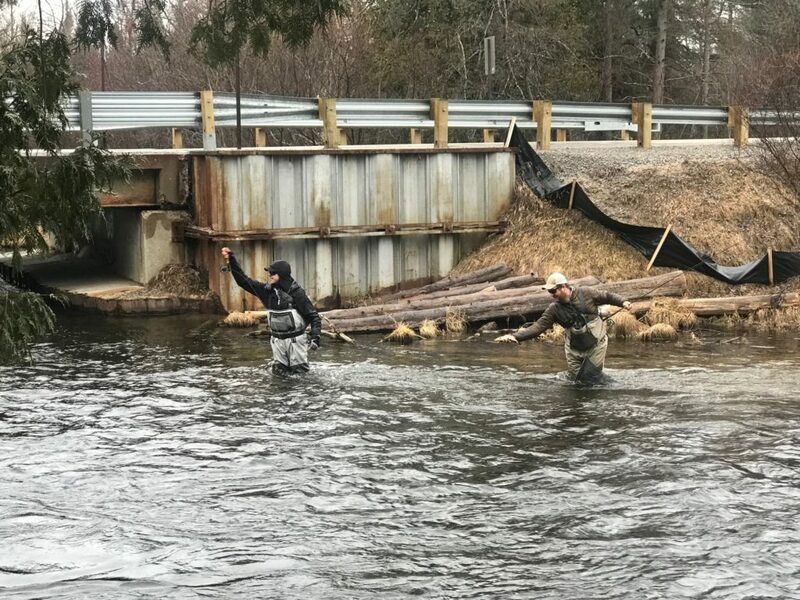 The tight line fishing has been good all winter but I think it really comes into its own as the water temperatures warm, which is now, and the fish move into the midstream runs to drift feed (instead of sulking under cover). The streamer fishing has been steady throughout the river system though I think the upper river has been fishing a bit better than the lower river. 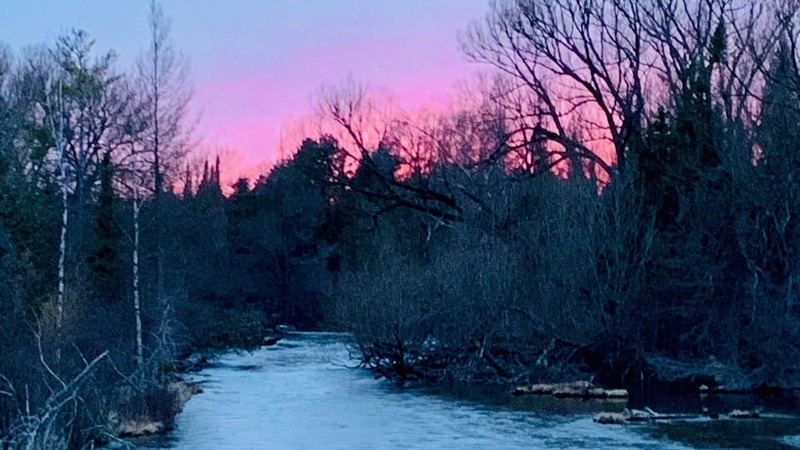 The South Branch is running at 350 cfs which makes it wadeable for those who know exactly what it’s like to wade the South Branch at 350 cfs. I would expect the South Branch to begin a slow and steady rise through the weekend. This river has several partial blockages, though it has received a little spring cleaning. 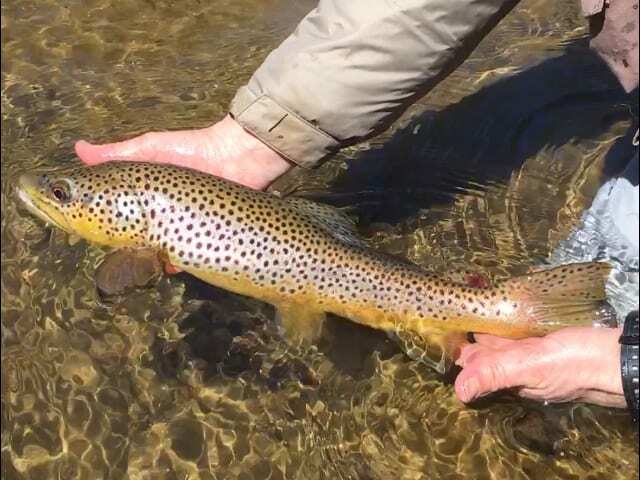 The Holy Water and the North Branch are in excellent shape right now running very clear and probably a bit below normal for this time of year. I do expect this will change during and after this weekend. But I also think we’ll see our first upright wings of the year…and probably a few trout eating them as well. Get out and enjoy this beautiful weekend on the river. We have a guide opening right now on Sunday and Monday, both of which look like excellent days to strip some streamers. Our restaurant is open this weekend on Friday and Saturday, with breakfast on Saturday and Sunday, and we have a few rooms still available to rent. It is an invigorating and exciting time to be fishing.